This cutting saddle is made from chocolate roughout. The jockey, seat, and fenders are slickout. It’s a close contact saddle with a square skirt. Nettles stirrups are 2 inches and the hardware is stainless. 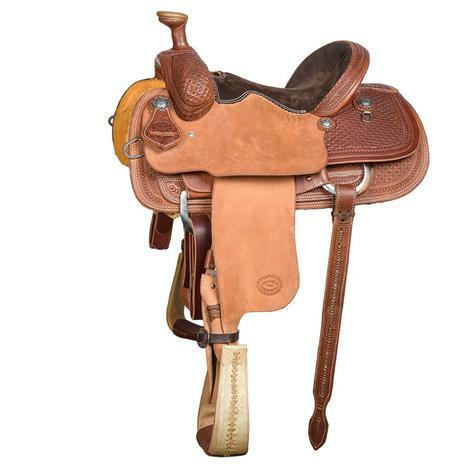 This exclusive STT trail saddle is built on a trail tree that has a 10 year warranty. The cantle is 4 inches, the swell is 8 inches, the gullet is 7 inches and the bar spread is 13 ½ inches. Slick out leather is half basket weave with a camo border. 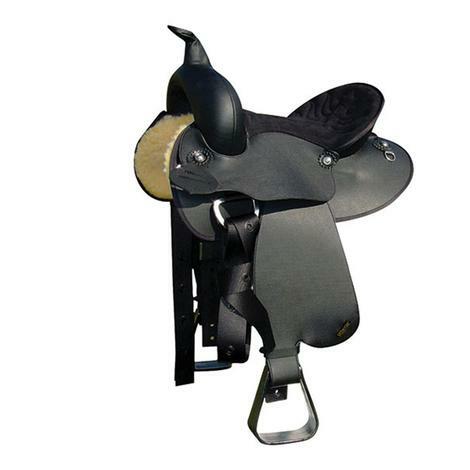 This trail saddle comes with stainless hardware and stirrups designed for trail riding. 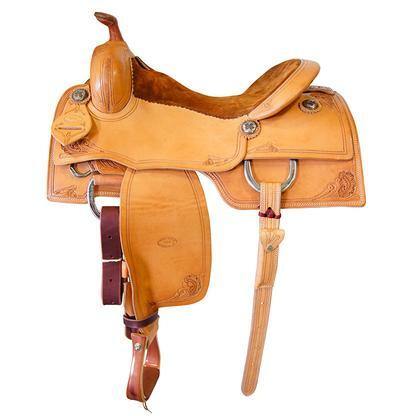 This is an STT strip down rancher saddle built on a Will James tree. 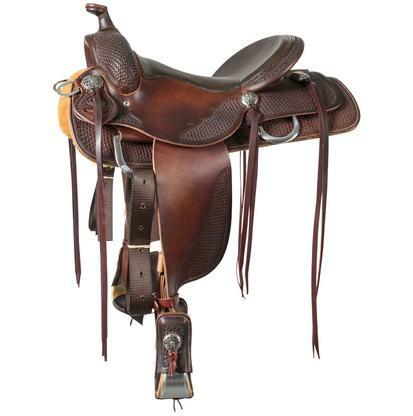 Swell Height: 7.5" Cantle: 3.5"
Youth roping saddle exclusive to STT. The suede seat is chocolate, the jockeys and fenders are rough out, and the tooling is a waffle pattern. The laced rawhide roping stirrups are 3 inches. 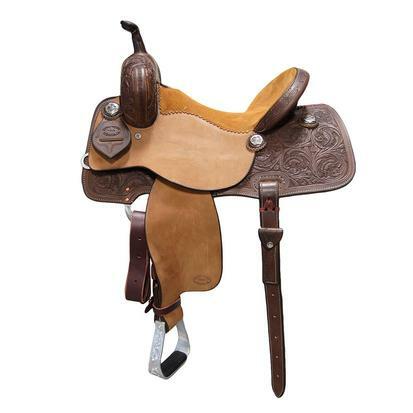 This saddle features engraved conchos and stainless steel hardware and comes with a 5 year tree warranty. Features durable synthetic leather that makes clean up a snap, Equi-Suede, extra foam padded stitched seat and a rounded skirt. 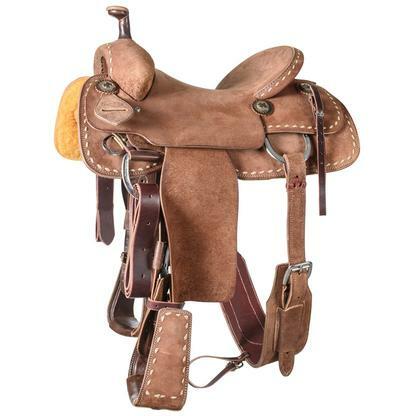 Features durable synthetic leather that makes clean up a snap, Equi-Suede, extra foam padded seats, PP saddle strings, and foam cushioned stirrup pads. The EZ Fold Fender System allows riders to easily self shape the fenders for their individual and customized comfort. 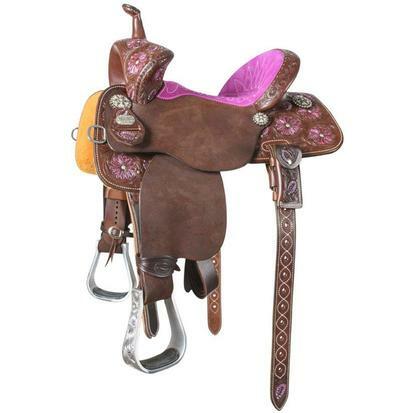 Sizes: 14", 15", 16" or 17"
This barrel racing saddle features stirrup positioning rig slots and forward angled stirrups. This design provides resistance and better body positioning thru your turns. Feet are kept in front of your center of gravity and retain full range of motion. The shortened seat jockey provides added stability and freedom of movement. Transitioning from standing to sitting is improved. The angled stirrups, stirrup positioning rig slots, and shortened seat jockey work together to improve ergonomics and enhance communication. 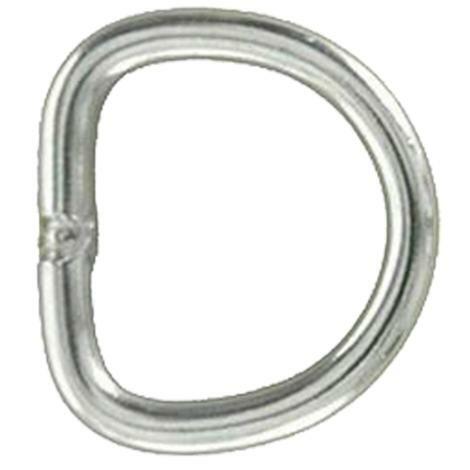 Added stability is achieved by a straight saddle horn that can be gripped from almost any angle. A shaped horn cap is designed to fit the palm for a reliable top grip option. This barrel racing saddle is roughout and has a Carlos border. 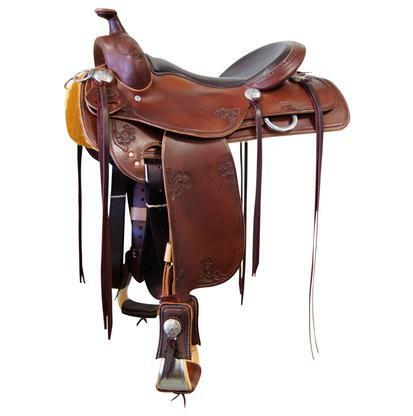 This is a full slick out STT trail saddle with full oak leaf scroll border, a square skirt and plate rigging. The gullet is 7 inches, the bar spread is 13 ½ inches, the swell height is 8 inches, and the cantle is 4 inches. The tree is a trail tree and comes with a 10 year warranty. This saddle is built on a cutter tree. The leather is rough out and the hardware is stainless. It’s a close contact cutting saddle with 2 ½ inch Nettle’s wooden stirrups. The antique slotted conchos have engraved German silver trim and latigo strings. 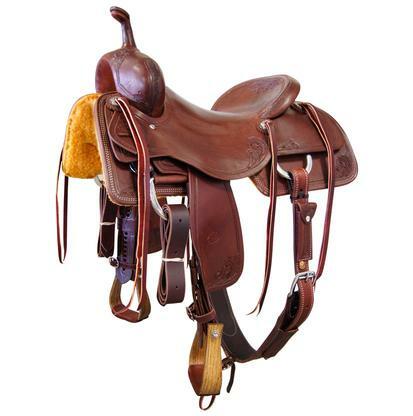 This barrel racing saddle features close contact, in skirt rigging, and Nettle’s stirrups. The stirrups are 2 inch wood with rubber grips. The slick leather is acorn tooled while the jockey and fenders are rough out. The seat is suede. 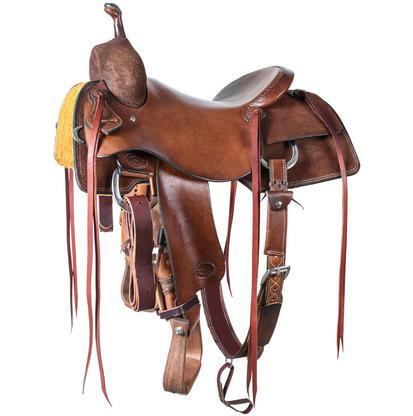 This is a cutter saddle with a gullet that is 6 ¾ inches, a swell height that is 8 ½ inches, a bar spread that is 13 ½ inches, and a cantle that is 3 inches. The full slick out leather has an oak leaf scroll border and Campbell Conchos. The stirrups are 2 inch Nettle’s all-purpose stirrups called ‘The Duke’. 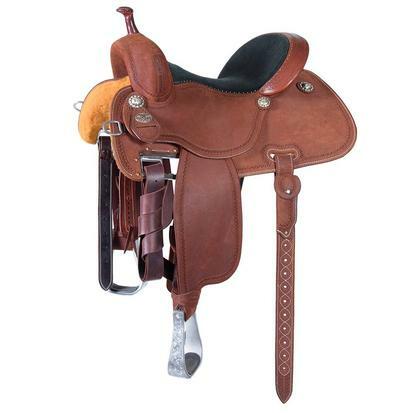 This saddle has a cutter tree that has a ten year warranty. This saddle is made from slick out leather with an oak leaf border. 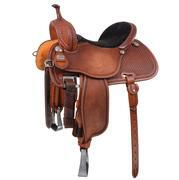 The seat is suede, the hardware is stainless, and the conchos are antique with oak leaf trim. The skirt is square, stitched, and close contact. The wooden stirrups are 2 inches. 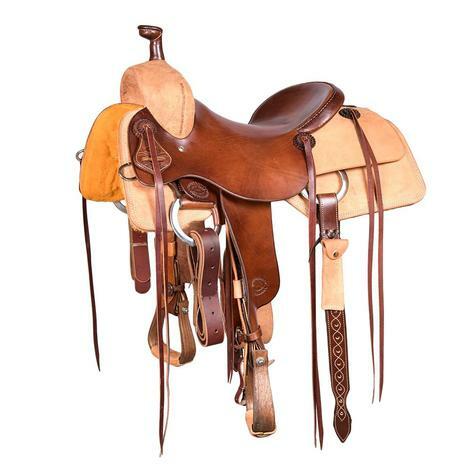 This is a full roughout chocolate leather team roper saddle with tooled roper stirrups, Campbell Conchos, rope strap, Texas Dally horn, and half tan buck stitch border. The gullet is 6 ¾ inches, the bar spread is 13 ½ inches, the swell height is 7 ½ inches, and the cantle is 3 inches. 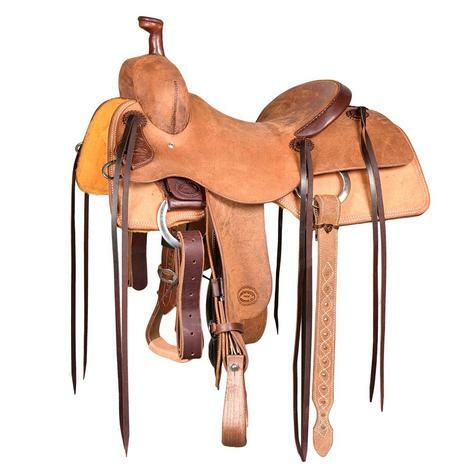 This saddle has a team roper tree that comes with a ten year warranty. This Cervi Crown C barrel racer saddle has a tree with a 4 inch cantle and a gullet that is 7 inches wide by 8 ¼ inches high. 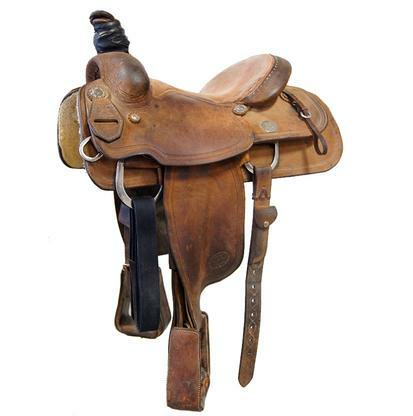 This saddle is half waffle and half chestnut roughout leather. 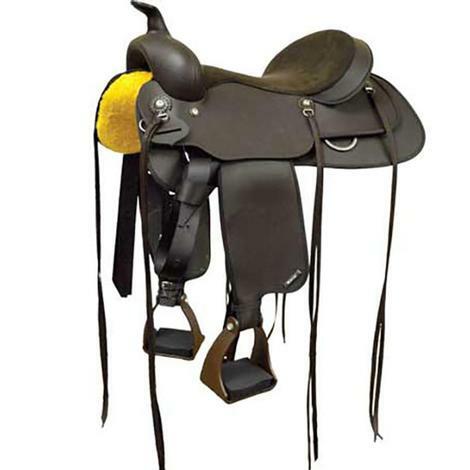 There is stainless in-skirt adjustable rigging, hamley twist, engraved aluminum stirrups, Wyoming flower conchos, and black suede seat. The finished horn is 3 inches in height and has a 2 inch cap. All used saddle buyers will be emailed a product liability form that must be signed and returned before saddle will be shipped. 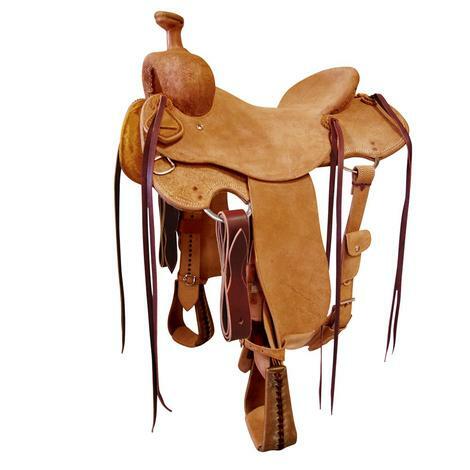 The saddle is a supportive structure for a rider or other load, fastened to an animal's back by a girth. 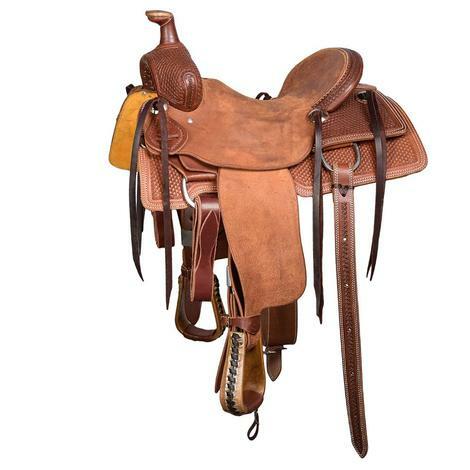 South Texas Tack carries saddles made only from the best materials by the most trusted manufacturers. 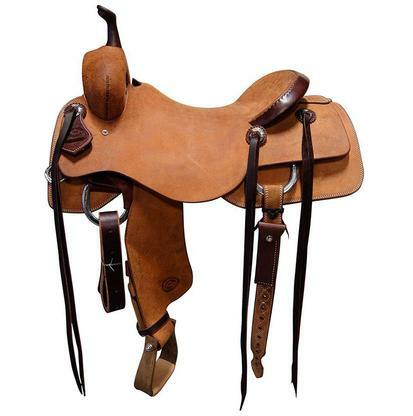 You and your horse deserve a comfortable saddle and we have them here at South Texas Tack.